Monday night saw a vigil at the campanile to honor Scout Schultz break into rioting, eventually ending in three arrests and two police officers wounded as well as property damage. The vigil was hosted by the Tech Progressive Student Alliance. Candles were distributed to attendees of the event, which attracted members of several media stations. Speakers included some members of the Pride Alliance Executive Board as well as Aby Parsons, Ph.D., director of the LGBTQIA resource center at Tech. “It’s also worth noting how much hard work Scout poured into our organization,” said Genny Kennedy, vice president of Pride Alliance. “How they managed to balance majoring in computer engineering, minoring in biomedical engineering and being involved in countless events on and off campus while maintaining exceptional grades is only a testimony to Scout’s true strength. The official event was concluded by the mass-lighting of the distributed candles along with a rendition of the song “I’ll Be There” by the Jackson 5. Soon after, individuals amongst those assembled for the vigil began speaking up. “Why don’t GTPD carry tasers?” yelled one person. “Why are they here at all?” asked another, to cheers and applause from the crowd. By about ten minutes after the last official speaker from the vigil concluded, other voices had taken control of the conversation in the area. Individuals with outfits and paraphernalia indicating affiliation with the group Antifa began to chant as well as beat a drum. “No justice, no peace! F*** the police!” went one chant. This continued for a period of time, after which the contingent, which numbered roughly 50-60 people, began to march down Skiles walkway towards Clough. The group turned left at the corner of Tech green and started north. During this period, individuals amongst the group continued to chant and beat drums. At least one carried a lit flare. Some that had been present at the vigil remained at their spots around the campanile. Dean of Students and Vice President of Student Life John Stein also stuck around afterwards. At one point, a student confronted Stein about a perceived lack of focus on mental health and counseling services by Tech administration. “The counseling center has been funded a great deal … ” Stein said. “Yea, well people are quitting in protest of the fact that the counseling center doesn’t get more funding,” the student said. “I should not have waited six weeks for a psychiatry appointment when I told them was suicidal,” the first student said. “And I agree with that,” Stein replied. At this point, Stein began to walk away from the campanile area, back towards the student center. Later, the marching contingent arrived around the Beringause building, which serves as the GTPD station. The situation grew violent, with one GTPD officer sustaining an injury to the head. Blood could be seen trickling down his scalp. A GTPD police vehicle was set ablaze as well, via an incendiary object thrown into the interior. 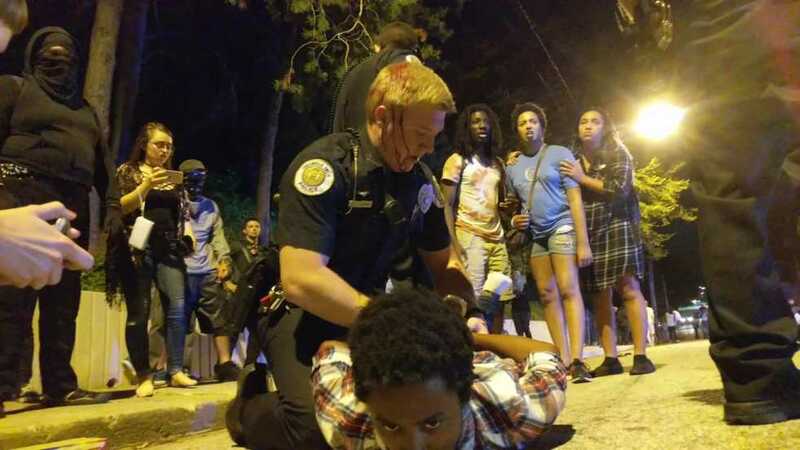 It was at this point that arrests began to be made, and three individuals would be in custody before the night was over. Cassandra Monden, who was booked as Andrew Xavier Monden by Fulton County, is a student at Tech and until recently was listed as the webmaster of Pride Alliance. Monden was charged with felony interference with government property as well as misdemeanor incitement of a riot. Vincent Castillenti, a non-student of age 31, was charged with felony aggravated assault and felony willful obstruction of an officer. Jacob Wilson, another non-student, was charged with three counts of felony aggravated assault in addition to three counts of misdemeanor trespass. A GTENS alert telling students to seek shelter was rescinded at about 11:00 p.m. Two police officers had been injured during the night, one of whom was taken to Grady Hospital for treatment. A statement issued by Institute Communications was issued in regards to the night’s events. On Tuesday morning, Tech President G.P. “Bud” Peterson made an Institute-wide statement that included remarks about the vigil and its aftermath.